Biddeford Sherpa style blankets are highest quality on the market. With the amazing softness and heated design, these blankets will make you smile! Long gone are the days of simply passing electricity through a wire in a blanket. Today you can expect the warm soothing comfort that comes from a quality Biddeford Blankets product. Biddeford heated products are more advanced than ever and we will continue to strive to provide you with the latest innovations and technology. Biddeford Blankets products allow you to not only rest comfortably, but rest assured as well. Analog control with 10 heat settings and 10 hour auto-off. Extra long 13 foot cord. 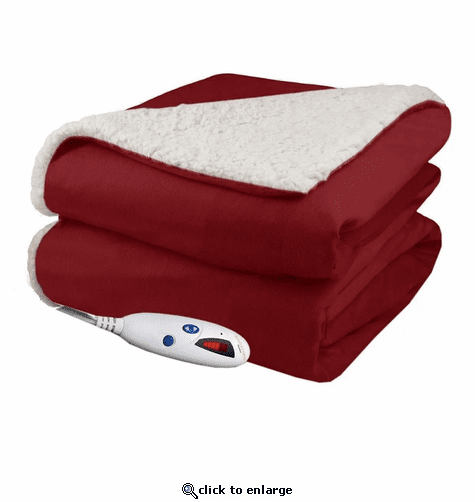 Auto-Off feature provides the sense-of-mind that allows you to enjoy your heated product to its fullest extent as you cozily drift off to sleep, not having to worry about waking up to turn off the blanket.